Hi, my name is Lorie; I am a NYC-based artist and cultural advocate. I first created this blog in 2015 as a means of documenting my experience as a student of a community arts program in Puerto Rico with CCCADI. 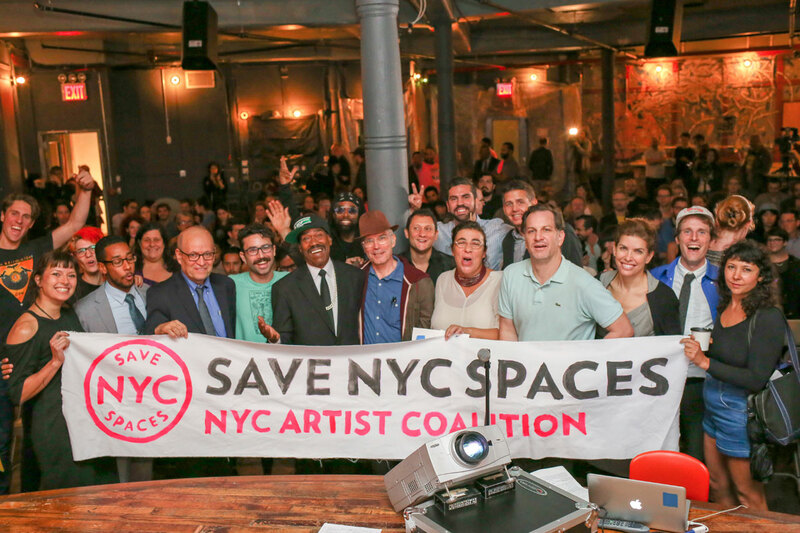 The blog has lived on, documenting my experiences in NYC and beyond, participating in artful events, and maintaining threads of community arts, social justice, EDI and the Puerto Rican diaspora. Thank you for your interest in my Travesía Artística! I hope to hear from you. El Museo del Barrio's Three Kings Day Parade! Have you ever noticed recurring themes in your life? Well, one recurring theme for me is parades. Not going to parades, but actually being in parades. It all started back when my Immaculata High School classmates and I were made to walk in the Columbus Day Parade - I was a flag twirler! I didn't particularly care for it, but I marched and twirled nonetheless. Through the years I have walked in numerous parades (some of my own volition and some with coaxing by friends); from the Puerto Rican Day Parade, to the Village Halloween Parade, to the Coney Island Mermaid Parade and the Dance Parade. Numerous times. Being an Arts Administration graduate student now, one of the program requirements is to get a professional internship. Last November, the opportunity arose to apply for an internship at one of my most beloved cultural institutions: El Museo del Barrio. And when I found out they would particularly need me to assist in the production of their 42nd Annual Three Kings Day Parade, I thought to myself: of course, this makes perfect sense! For the purposes of this blog post, I won't go into detail about the work that was done leading up to the parade, but suffice to say El Museo's entire staff puts in a lot of time and energy preparing for this huge annual event which pays homage to the Caribbean/Latin American holiday tradition connecting with the surrounding community. In addition to the actual parade, there's a breakfast and awards ceremony immediately beforehand and a celebration with live performances after - so it's like three events in one. As an intern, I was working between two departments - Public Programming, and Marketing and Communications. Leading up to the parade, I helped with whatever was needed. I was not aware of where I would be stationed on the big day. And then I met Rhina. Rhina "La Reina" Valentin, a well-known host of BronxNet TV show Open, was to host El Museo's first ever Facebook Live feed of the parade. It was a great match since Rhina is a super-energetic host and (as I would soon learn) knows just about everyone in El Barrio. Rhina's partner in crime, Spock, was there to help produce the show, along with Alo from the East Harlem Culture Collective on camera/tech duty. I became a defacto Production Assistant. I'd never worked in film production before, but since I had a level of familiarity with parades, I was up for the task. Early on Friday morning, January 4th, 2019 when people started pouring in to El Museo for the breakfast, we started by grabbing a few honorees for interviews - Dr. Betty Rosa, Hiram Maristany, and Jorge Ramos, all dressed in amazing regalia. From there the award ceremony, hosted by comedien Victor Cruz, began with remarks from elected officials like Melissa Mark Viverito, Gayle Brewer, and Ruben Diaz Jr. This year's theme was "Advocacy in Action" and all of the Kings, Madrinas and Padrinos being honored embodied that spirit in some way. King Emeritus, Jesus "Papoleto" Melendez graced us with a powerful poem before the awards were distributed. Suddenly, a lively parranda appeared and lead us over to the parade route, starting at 106th and Park. It was hard to miss the giant puppets created by artist Polina Porras, representing the Three Kings, awaiting us along with lots and lots of school children wearing crowns. Rhina immediately went into full gear, sprinting effervescently through the parade interviewing so many people - and even dancing a few times along the way. Alo filmed the livestream without a break from the start to the end of the parade where we finally met the Three Kings and the three (live!) camels. Another parade under my belt. In the end, it was an amazing event to participate in. The fact that El Museo has carried on this tradition for 42 years is a feat in and of itself. 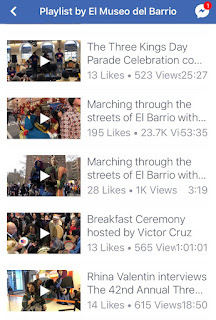 It's a beautiful tribute to Three Kings Day, to El Barrio, to Caribbean, Latinx and Latin American communities; and a lovely demonstration of maintaining important cultural traditions within a rapidly-changing neighborhood. I managed to snap some candid shots and video clips along the way. I have posted them below, along with the Facebook live links from EL Museo's Facebook page. To see more of my photos, check out IG @whippedhoney. Rhina interviewing Dr. Betty Rosa while Alo films. Rhina interviewing Hiram Maristany with Three Kings puppets in the background. Ruben Diaz Jr. addressing the crowd at the award ceremony. Parranda in the lobby of El Museo. Kids and Kings, waiting for the parade to start at 106th and Park. Rhina interviewing Polina about her puppets. Cabezudos (Big-Head Puppets) from Loisaida. Wabafu Garifuna Dance Theater float. Rhina dancing along with Fogo Azul. 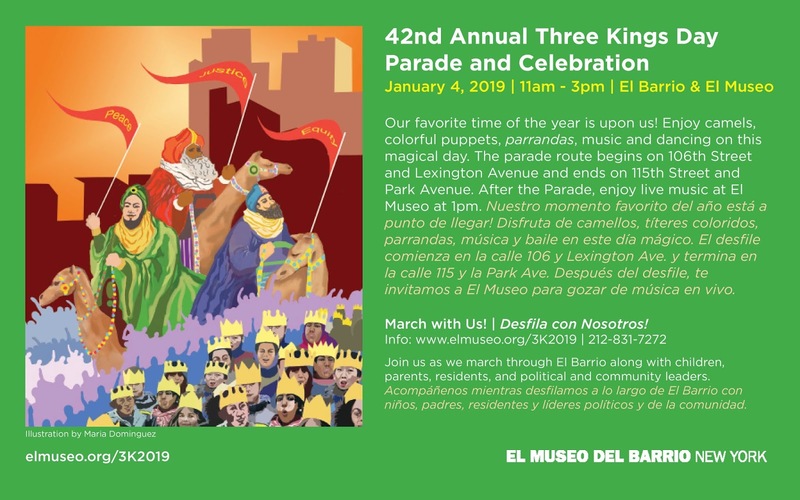 Link to El Museo del Barrio's Facebook Live Video: Rhina Valentin interviews The 42nd Annual Three Kings Honorees at El Museo Del Barrio. 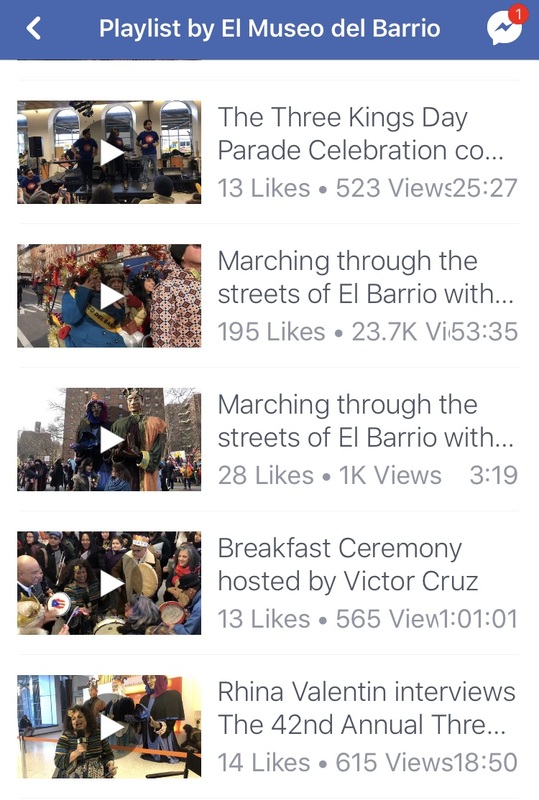 Link to El Museo del Barrio's Facebook Live Video: Marching through the streets of El Barrio with Rhina Valentin for the 42nd Annual Three Kings Day Parade. Today I received a newsletter published by the Graduate Student Assembly at Baruch College. Lo and behold - what do I see? A photo of me (in a banana yellow sweater! ), flanked by smiling classmates visiting the closing plenary event at the APAP Conference. It made me giggle because I have a running joke with friends about the fact that I keep ending up in newsletters photos. I happen to have some of these newsletters on file, so I thought it would be fun to share them here in a blog post. It seems to be a recurring phenomenon - so don't be surprised if you see my face in your local circular sometime in the future. Hopefully I won't be wearing banana yellow next time. I joke, but I am actually proud to have attended (and in some cases participated or contributed to) these events/programs, for which I just so happened to end up in the photos. It's nice to be have these keepsakes and reminders of time well spent. 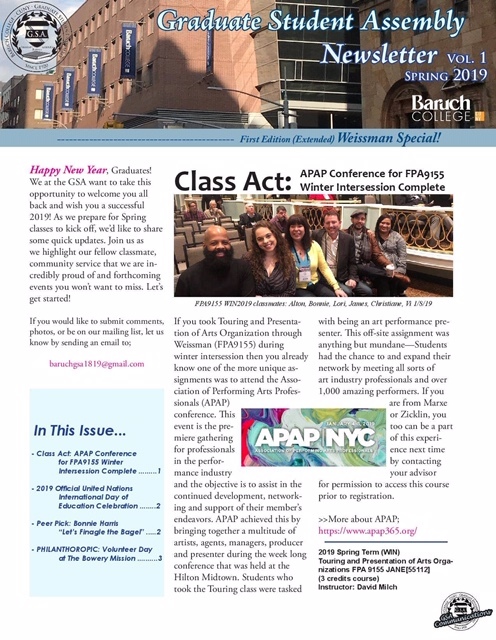 Baruch Graduate Student Assembly Newsletter, January 2019, re: Touring & Presenting class at the APAP Conference. Night Mayor Town Hall event. 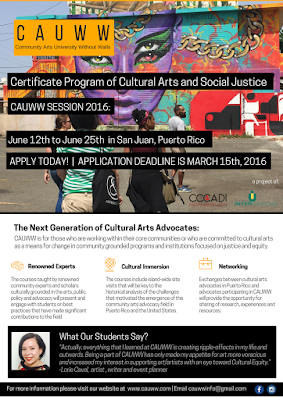 Caribbean Cultural Center African Diaspora Institute, informational flyer for Community Arts University Without Walls program, 2016. Brooklyn Museum Membership Newsletter, April 2014. As an artist, I've always been drawn to painting, particularly. However, in the recent years I've also been drawn towards arts organizing, working behind the scenes, connecting with groups and individuals who use art as a vehicle for Social Justice, Cultural Equity, and Civil Rights. I've had the great privilege of being in the presence of visionary activists like Dr. Marta Moreno Vega (through CCCADI), and über-creative artists like Núria Güell (through UNIDEE), and many others. I was lucky enough to be in the right place/time to help build a group, Queens Creative Solidarity, and learn first hand from community organizers and artivists, working on many different projects, behind the scenes - and so it's spiraled outwards, and onward... Recently as an artist, I've found myself exploring Social Practice. The participatory element of socially engaged practice, is key, with the artworks created often holding equal or less importance to the collaborative act of creating them. Socially engaged practice can be associated with activism because it often deals with political issues. Artists who work within this field will often spend much time integrating into the specific community which they wish to help, educate or simply share with. I say all of this to say: a few years ago, I had no idea what the term "Social Practice" meant, yet somehow, I was becoming involved in it myself. I often tend to serendipitously get involved in things first, only to look back and say, "Hey! That was an amazing thing I was a part of!" I by no means want to downplay the work of socially engaged artists by saying because I stumbled upon this work it's simple - actually Social Practice is something that can be extremely powerful; it's becoming more and more prevalent in the arts and cultural landscape, some universities are also offering graduate degrees in the field. Again, I just happen to be extremely lucky in being able to learn from folks who are doing the work, in real time. Being involved in Queens Creative Solidarity (QCS) and considering what it means to be "in solidarity" I thought it was a great opportunity for us to support another local arts group - Southeast Queens Artist Alliance (SEQAA) - in their inaugural arts festival. The event was called the SEQAA (C)art Festival, taking place at the King Manor Museum in Jamaica, Queens on September 1st, 2018. One of my QCS friends, multi-disciplinary artist Priscilla Stadler and I collaborated on an project to be included. All of the works included in the (C)art Festival was participatory, and some were on carts (see list of artists and projects below). So, Priscilla and I came up with a fitting project called PoeTREE - the original iteration of which we did at the QCS art residency at Queens Museum in 2016. The second iteration of PoeTREE for the (C)art Fest was a cart holding a cardboard tree sculpture, which visitors were invited to "help grow" by drawing and painting on the branches and roots, making paper leaves and writing poetry, thoughts, memories, impressions about trees, roots and the Wood Wide Web. Doing the PoeTREE with Priscilla was a great experience. We had a lot of fun actually building the PoeTREE sculpture at her studio beforehand. On-site at the (C)art Fest, the actual art-making was not up to us, it was up to the visitors. Lucky for me, Priscilla is well-versed in socially engaged art-making and knows how to make folks feel welcome and encourage them to participate. I'm usually a little more reserved with people I don't know, but following Priscilla's lead, I did my best at inviting everyone to help construct the increasingly-colorful sculpture. We ended up with a beautiful tree! Every branch, root and leaf decorated with the designs and words imagined by the participants, young and old. It was a fun and beautiful group effort, paying homage to the majesty of trees, (our) roots, collective creativity and communication. Here are some photos I snapped of the PoeTREE process, from beginning to end. Constructing the PoeTREE cart at Priscilla's art studio. Starting to set up the PoeTREE area at the (C)art Festival at King Manor Museum in Rufus King Park. Priscilla and me with a bare PoeTREE. A real tree helping to encourage communication. The PoeTREE cart and some visitors. Priscilla and a young poet. "I'm a tree-hugger and proud of it!" A group effort, "Live & Let Live"
Family tree, with my cousin and friend. Final result of our colorful PoeTREE! Writer, poet, music enthusiast, self-taught painter, visual artist, event producer, ambivert, book worm, not a morning person, capoeirista, amateur percussionist, nightlife lover, native New Yorker - and believer in the awesome power of art and artists.